Amazing footage of the Kfir Squadron that operates out of Palanquero in the Andes Mountains. As The State of Israel celebrates its 70th year of independence, some key elements of its history lives on in various and exotic parts of the World. Israel, well known for its technological prowess is considered an innovative high tech superpower. One of Israel’s most famous developments of the 1970s was its “Kfir” fighter jet. The Kfir was based on plans designed by the IAF for the French company Dassault and then stolen from the French when they imposed an arms embargo on Israel following the 6 Day War. Israel Aircraft Industries in conjunction with the IAF developed and produced this sleek fighter, naming it “Kfir” (young lion). The Kfir served with the IAF from its first flight in 1975 until 1989. Israel found considerable success in selling the fighter to various countries around the World, the Kfir was even purchased by the US Marine Corps. to provide an aggressor type threat to train its combat pilots. Among the countries that purchased the Kfir early on was the Colombian Air Force (Fuerza Aérea Colombiana'). 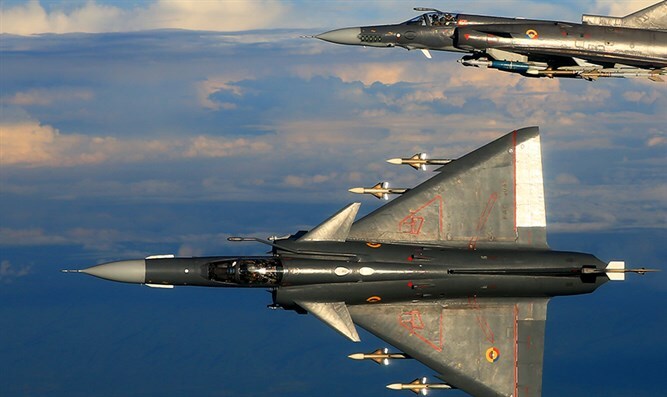 In 1988 they purchased 9 Kfir aircraft, in 2010 they upgraded these aircraft and purchased an additional 15 aircraft from Israel Aircraft Industries. These aircraft were fitted with advanced Israeli technology. The Kfirs were equipped with RAFAEL made Python 5 and Derby air to air missiles as well as RAFAEL’s air to ground Spice 1000 guided glide bomb. Additionally the Colombian Pilots fly with Elbit’s Helmet Mounted Display which is the same helmet used by IAF fighter pilots. In essence the Colombian Air Force fly Israel’s most advanced weaponry on an Israeli made aircraft. I was privileged to receive an invite from the Colombian Air Force to fly with these amazing aircraft. The Kfir Squadron, also known as the 111th Squadron, operates out of a base called Palanquero which is in a valley along the banks of the Magdalena River and between two large mountain ranges that are part of the Andes Mountains. The weather in the area is tropical, it rains daily, with high temperatures and high humidity producing lush jungle greenery that is amazing to see. I was slated to fly with one of the Kfir aircraft on a training mission. The training mission was for two young Kfir Pilots to do an Air Refuelling mission for the first time. Not surprising at all is that the KC767 Tanker nicknamed “Jupiter” was actually converted to a tanker aircraft by IAI as well. So I am really flying in the Israeli made section of the Colombian Air Force!! During my visit I had the privilege of speaking with several of the FAC pilots. In the past months they had been training in the US. The Kfir participated in a variety of exercises alongside the most advanced American jets such as the F22, F15, and F16. Maj. Alex “Jak” Martinez, a Kfir Operator, said the Americans were extremely impressed with the assortment of weapons the Israeli made platform provides them with. Maj. Sanchez, another Kfir pilot said the Americans were most impressed with the Kfir’s capability to utilize the Spice guided bomb which allows the Kfir the ability to attack ground targets from beyond the enemy’s threat envelope. Much like the Israeli Air Force, Colombian Air Force personnel live on the base with their families. This creates some interesting stories much like Maj. Sanchez During our stay at the base we worked very closely with Maj. Sanchez, the 111th Operations Officer, Maj. Sanchez’s father was an NCO as an Armament Officer on the Mirage 5, the FAC’s previous frontline fighter. Maj. Sanchez was born in Palanquero and grew up on the base. He remembers walking with his father between the shelters as a child, today he walks down the same line his father did. He said that thinking of his time with his father on the line was what motivated him throughout his training. The main purpose of the FAC’s participation was to test the KFIR’s new (mostly Israeli) equipment and capabilities in a realistic environment such as Red Flag, the secondary purpose was to test the 111th pilots’ skills, training and experience in a 5th generation combat scenario. Lastly, its final goal was to learn how to interoperate with other squadrons following NATO rules and standards. All that while strengthening Colombia’s partnership with the United States as one of their key allies in the region. One thing is for sure – The Israeli Fighter is still alive and kicking – and still poses a threat to any aircraft thinking of going up against it – whether in the USA or in South America. Special thanks to Maj. Eliana Marin, Maj. Freddy Figeroa, Maj. Alex Martinez, Col. Jorge Ortiz and the Commander of Fuerza Area Colombiana, Gen. Carlos Eduardo Bueno Vargas for assisting in producing this article.